Consider using this as an introduction to biofuels basics for a lesson on biofuels. Have students then research the pros and cons of biofuels. Would serve as a nice intro to any unit on biofuels. Could use for differentiation for basic introduction to terminology. The video gives an informational review of the biofuel fundamental concepts: what biofuels are, what they are made from, how they are produced, and how they can be used. Biomass is an organic renewable energy source that includes materials such as non-food agriculture and forest residues, energy crops, and algae. Scientists and engineers at the U.S. Department of Energy and its national laboratories are finding new, more efficient ways to convert biomass into biofuels that can take the place of conventional fuels like gasoline, diesel, and jet fuel. Comments from expert scientist: This video is the most up to date with respect to the current focus of biofuels research. The video does not go into great detail about the subject or mention the economic and socio-political implications of biofuels. Clear and concise explanations of how biofuels are made and how using them benefits the environment. 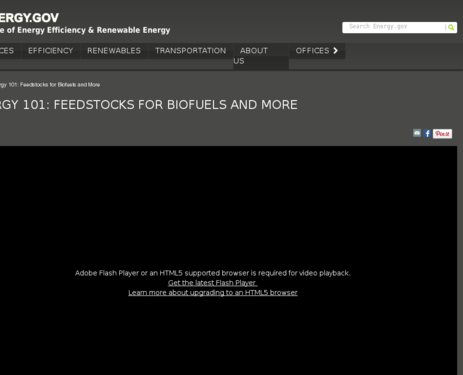 Focus of video is that biofuel is US-grown fuel source that can reduce our dependence on foreign oil. Greenhouse gas emissions reduction and benefits of renewable energy sources are not mentioned.